Before and after photos of the Adopt A Stop bus shelter. One bus shelter along Maxwell Main Road is not blank following the removal of an anti-littering message which has been met with some criticism and disapproval, but that's stopping the message from hitting the streets. 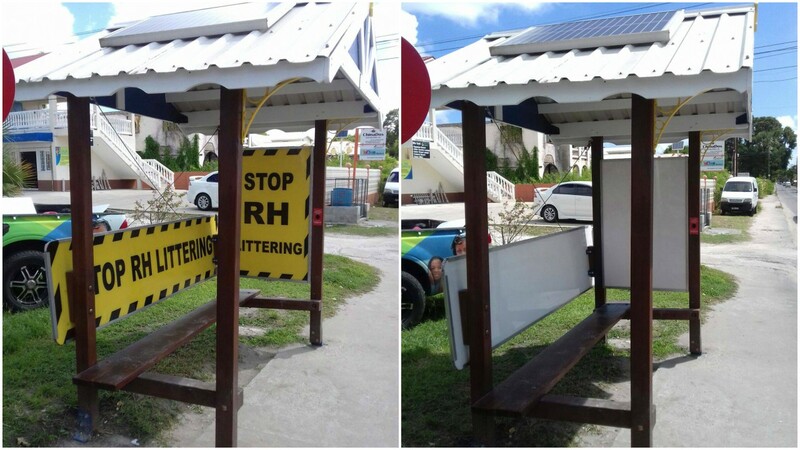 According to press release issued by the company in charge of the bus shelters, Adopt A Stop, the removal of the yellow anti-littering signs which were erected three weeks ago on solar bus shelters around the island, has been ordered by the Transport Authority. 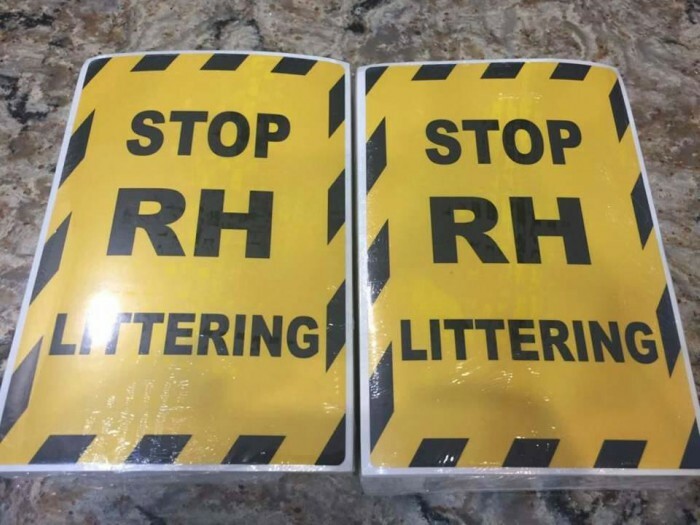 "The apparent reason for the removal is that the letters RH contained in the design could be perceived as an acronym for a well-know local profanity." Project Co-ordinator for the Adopt A Stop project, Barney Gibbs said, "The Transport Authority rarely exercise their right to veto any messaging on the bus shelters, but they do have that right under the terms of our agreement, so we had to comply." Gibbs noted that in an earlier press article that in his view the meaning of RH was in the eye of the beholder, with a possible interpretation it being 'Road and Highway'. 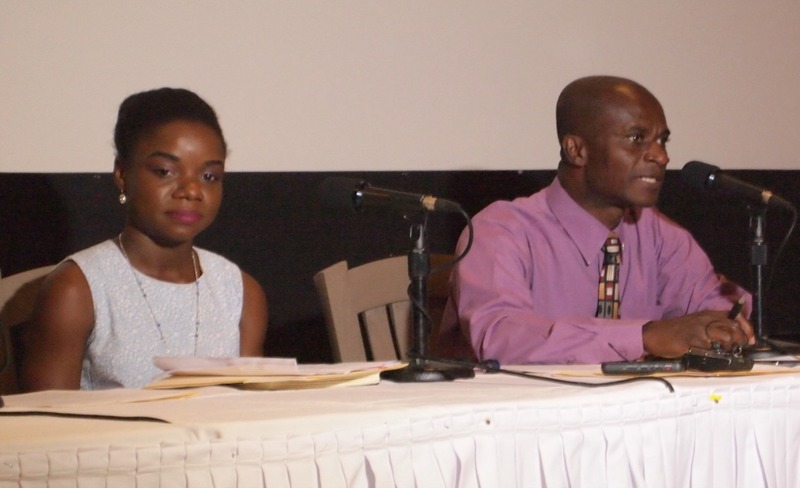 The release continued to state that "Double entrendre or ambiguity in messaging where one meaning may be risque is a frequently used and very effective technique employed in calypsos and other forms of social commentary." As regards the sponsor of the campaign, Gibbs related: "The sponsor is understandably disappointed because the message was resonating, both locally and with Barbadians overseas." However, Adopt A Stop has subsequently decided to pivot and circulate the slogan using a replica bumper sticker, "in order to maintain the momentum of this important anti-littering message." Stickers can be requested. On Adopt A Stop's Facebook page the comments are mixed. 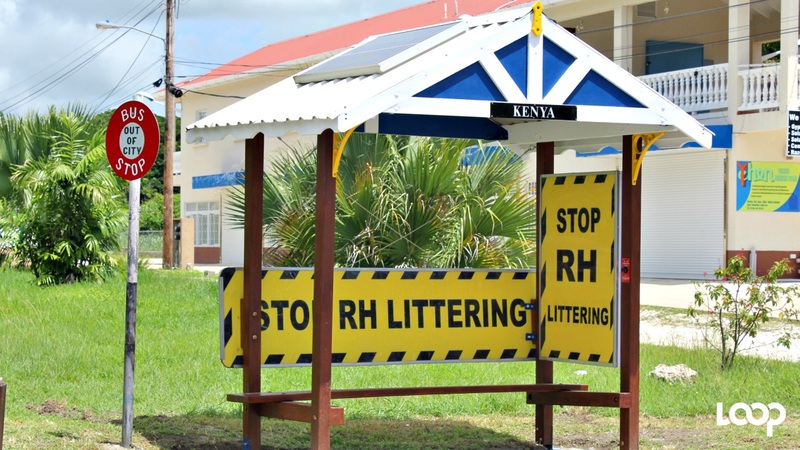 Some persons are in agreement with the removal calling the message "crass", while others say that at least it created a much-needed buzz around the problem of littering on island. Fromm the comments it was also noted that persons are quickly taking up the alternative form as they are posting photos of the stickers which they requested and successfully received in the mail already.